This is a portrait of General Frederick Funston. Funston was appointed colonel of the 20th Kansas Infantry and was soon sent to the Philippine Islands. On February 4, 1899, the insurrection broke out. Because of his leadership, Funston was awarded the Congressional Medal of Honor and promoted to the rank of Brigadier General Volunteers. Although the 20th Kansas served only a year, Funston returned to the Philippines in late December, 1899. He personally led the small troop of American soldiers and Macabebe scouts in the capture of the famed Filipino insurrectionist, Emilio Aguinaldo. Criticized by some for the unethical posing as a spy to bring about the capture, Funston was nevertheless awarded a commission as a Brigadier General, Regular Army, June, 1901. At the time, Funston was 35 years old and the youngest general in the army. In 1906 he did much to keep law and order in San Francisco and to provide relief to sufferers of the great earthquake. In 1914 he was in command of American troops on the Texas border during the difficulties with Pancho Villa. Future general, John J. Pershing, was one of his subordinates. On November 17, 1914, Funston was made a Major General. A heart attack took the life of the 51-year-old general on February 19, 1917. This is a portrait of General Frederick Funston. Funston was appointed colonel of the 20th Kansas Infantry and was soon sent to the Philippine Islands. On February 4, 1899, the insurrection broke out. Because of his leadership, Funston was awarded the Congressional Medal of Honor and promoted to the rank of Brigadier General Volunteers. Although the 20th Kansas served only a year, Funston returned to the Philippines in late December, 1899. He personally led the small troop of American soldiers and Macabebe scouts in the capture of the famed Filipino insurrectionist, Emilio Aguinaldo. Criticized by some for the unethical posing as a spy to bring about the capture, Funston was nevertheless awarded a commission as a Brigadier General, Regular Army, June, 1901. At the time, Funston was 35 years old and the youngest general in the army. In 1906 he did much to keep law and order in San Francisco and to provide relief to sufferers of the great earthquake. In 1914 he was in command of American troops on the Texas border during the difficulties with Pancho Villa. Future general, John J. Pershing, was one of his subordinates. 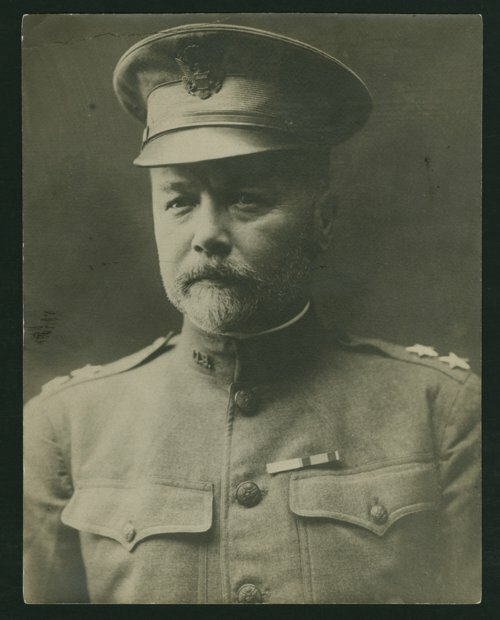 On November 17, 1914, Funston was made a Major General. A heart attack took the life of the 51-year-old general on February 19, 1917.